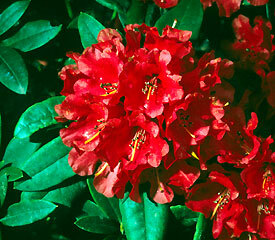 Flower/Truss Description: Flower widely funnel-campanulate, 2½" across, red with brown spots on 3 dorsal lobes. Held in ball-shaped truss of about 10. Foliage Description / Plant Habit: Leaves lanceolate, acute apex, cuneate base, 3" long, dark green with orange indumentum, leaves retained 3 years. Grows wider than tall.